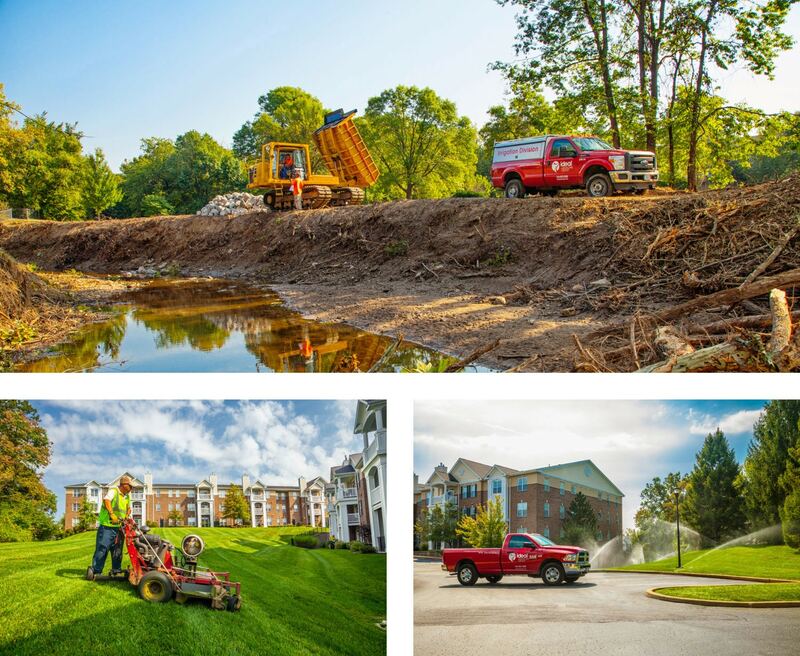 Ideal Landscape Group recently contracted Visual Lure to help improve their online presence by redesigning their website. 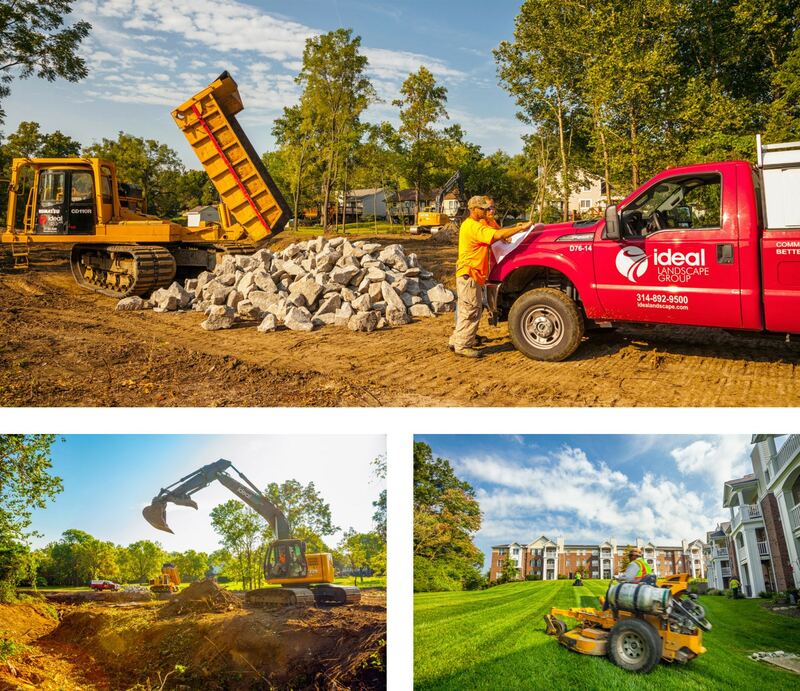 Ideal is a premier St. Louis commercial landscaping company that specializes in commercial groundskeeping, construction, irrigation, snow & ice removal and playground installation. 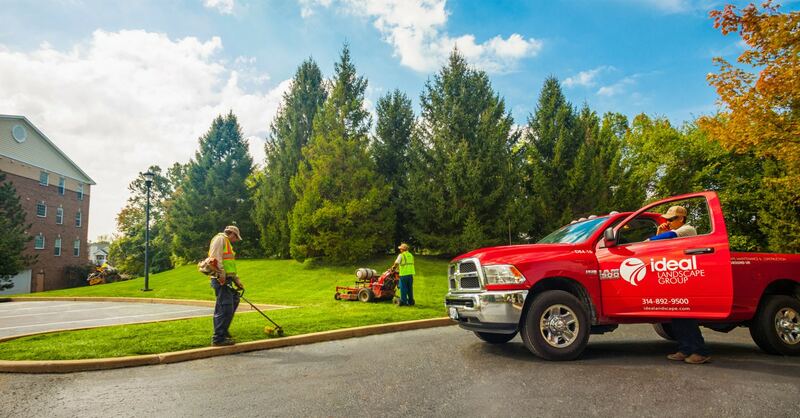 In addition to design and development of the new site, Visual Lure coordinated the copywriting and photography through our strategic partnerships. Cindy Sorgea wrote the copy and Matt Marcinkowski captured the imagery. The old website (home page shown above) was extremely dated; at least 8 years old. It was not mobile friendly or responsive, therefor providing a bad user experience on mobile devices. It had a strange layout, all types of spacing issues and dated photography. Over the years, and especially since Google’s “Mobilegeddon”, the site had seen a steady decrease in traffic and drop in organic rankings. The new home page design is now better organized with a much improved flow. The side navigation bar is sticky, staying in place while the user scrolls. This makes it easy to navigate the site, no matter where you are on the page. There is a custom Core Services section (slideshow) showcasing a featured image, intro copy and learn more buttons to drive users to those landing pages. Below that is an Affiliations section that uses a simple WordPress image widget to add, edit, remove or reorganize the affiliate logos. 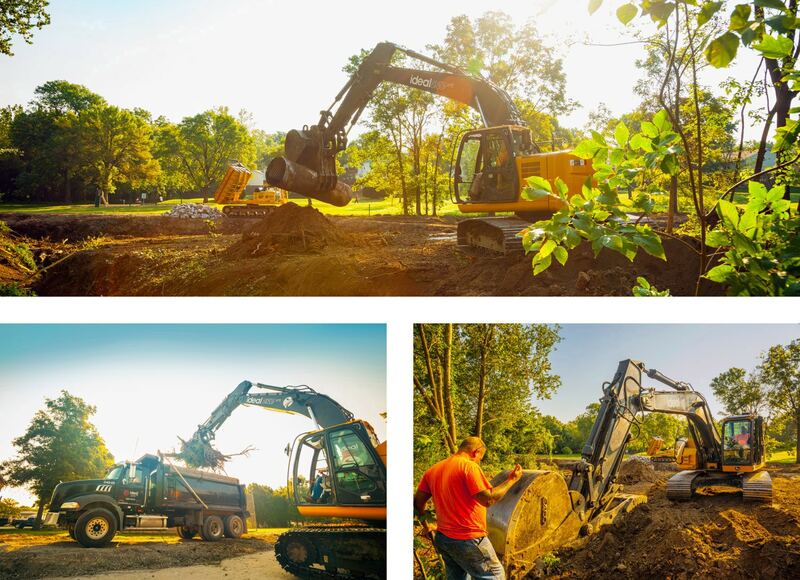 We had the pleasure of working with Matt Marcinkowski for the new site photography. We art directed a couple of shots, but it was mostly just Matt doing his thing. With some of the locations providing limited photo opportunities, Matt really turned nothing into something great. Below are some samples of the new photography. Since the new site has been indexed by Google, the (now properly search engine optimized) website has skyrocketed into top positions on the first page of Google for almost all of their core targeted search terms. 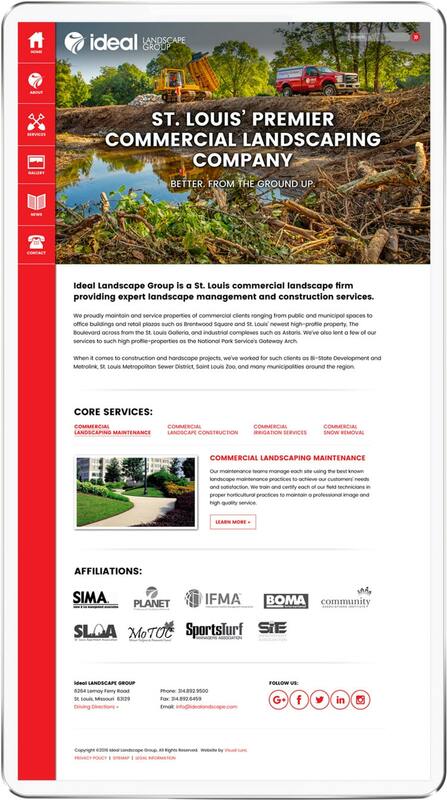 Currently the website is ranking #1 on the first page of Google for “st louis commercial landscaping”, “st louis commercial landcare”, st louis commercial groundkeeping”, “st louis commercial landscape construction” along with most variations of those search terms. This has led to a solid stream of high value leads for Ideal and they are currently bidding on a handful of projects (leads acquired through the new site) that would pay for the new website 10 times over. Balanced Care for Women is a team of three OBGYN specialist in St. Louis, MO made up of Laura A. Baalmann, M.D., Holly Hiroko Kodner, M.D. and Donna N. Senciboy, D.O., M.H.A. Their offices are located right off of I-270 on Olive Boulevard. 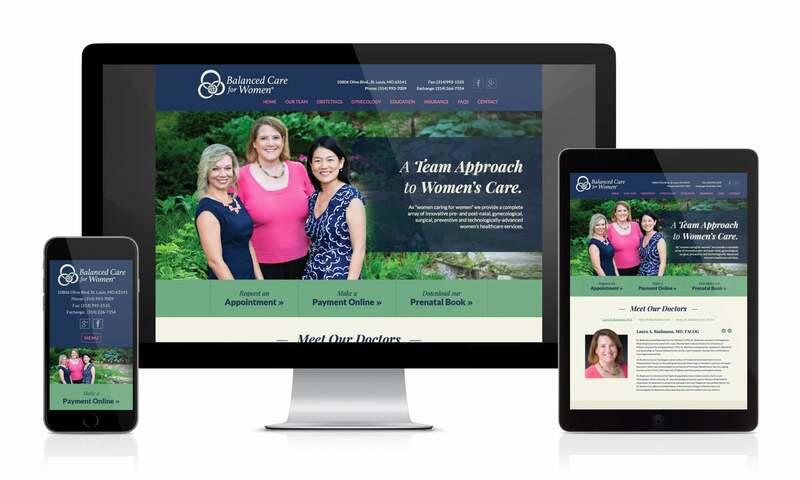 Balanced Care for Women came to Visual Lure when they wanted to redesign their existing website. Their old website was dated and non-mobile friendly which provided a bad user experience. Visual Lure’s new design was built using a fully custom, search engine optimized, responsive designed WordPress theme. The new site now renders beautifully on all phones, tablets and desktop computers. New features include a form to schedule appointments, an e-commerce section that allows customer to pay their invoices securely online, a custom admin section to manage staff profiles and a sticky header. The sticky header keeps the logo and navigation at the top of the screen, no matter how far down you scroll, always making it easy to navigate the site. 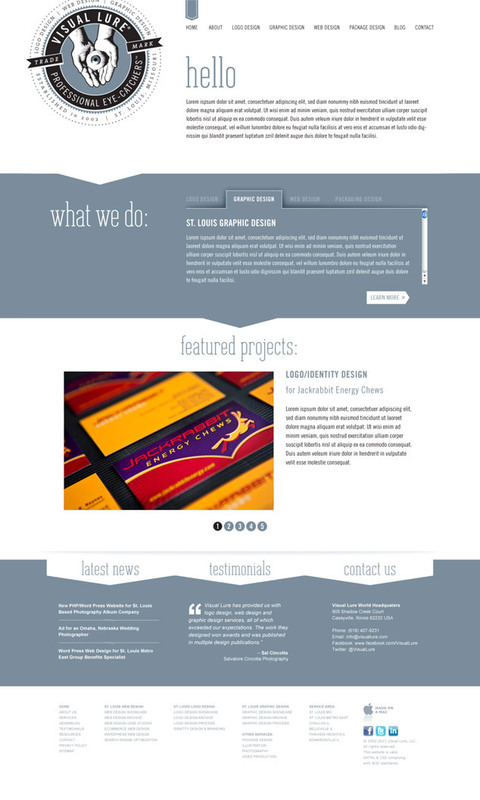 We also added elegant CSS animation effects to give the site a sense of sophistication. One of our most difficult clients to please has always been ourselves. We have had the same website since 2004 due to multiple reasons. 1. We have been so busy taking care of our clients that it’s been difficult to find the time to fully take care of our own needs. 2. We as designers, find it hard to design for ourselves because we are so critical of our own work, plus we constantly like to explore new design aesthetics, and 3. Web design trends are constantly evolving and we find ourselves always wanting to utilize the latest and greatest ones. However, there comes a time when things must be done – and for us – that time was now. What truly motivated us was the announcement from Google that on April 21st of 2015 they will be releasing a new algorithm that will effect search results for websites that are not mobile friendly. As of January 2014 all the websites we design and develop for our clients have been done so utilizing responsive (mobile friendly) website design, but our site has yet to be completely converted. Responsive web design is the practice of designing and developing websites so that they automatically transform to fit the screens of the devices they are being viewed from, including desktop computers, tablets and smart phones. This technique ensures that users have a great user experience no matter how they are viewing a website. For instance, font sizes may increase on the tablet and mobile versions so that users don’t have to zoom in to easily read text, and layouts may shift so that the content remains logically structured while increasing or decreasing in size. Our current blog is responsive, but the rest of our website is not. We currently rank on the first page of Google for all our targeted search terms and we don’t want to take the risk of dropping due to this update. With that being said, here is a little sneak peek at some of our unused designs over the years along with our new design that is currently under development. Our new site will be built in WordPress utilizing a fully custom theme. The new theme will feature custom admin sections making it easy for us to update our portfolios. It will also have tons of cool CSS effects and animations. Look for the launch of our new website coming soon! Is your current website not responsive or mobile friendly? If your current website is not mobile friendly, and you are looking for a new web design company, give Visual Lure a call today. 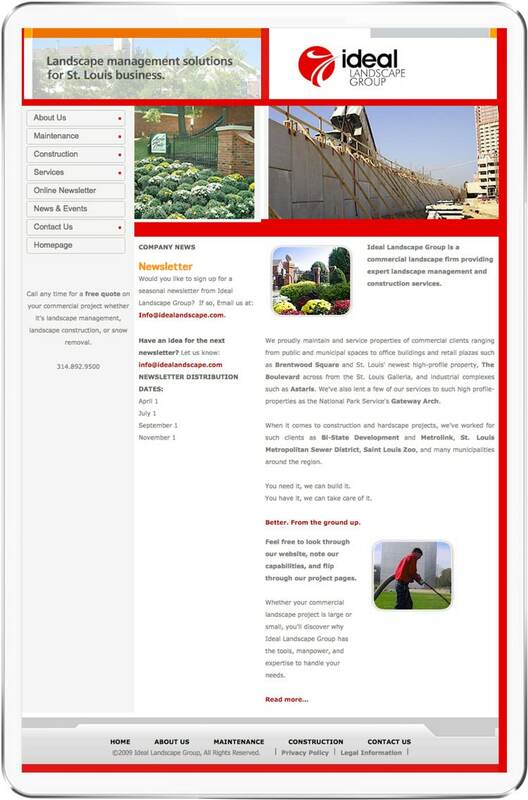 With a free website design consultation we can explore your options and provide you with a free estimate. 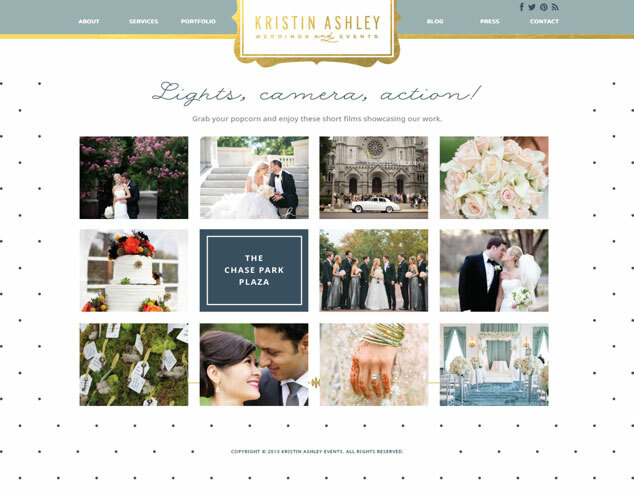 Visual Lure had the pleasure of working with Kristin Weis (again), and Cheree Berry Paper, to develop Kristin Ashley Events’ new custom WordPress website. 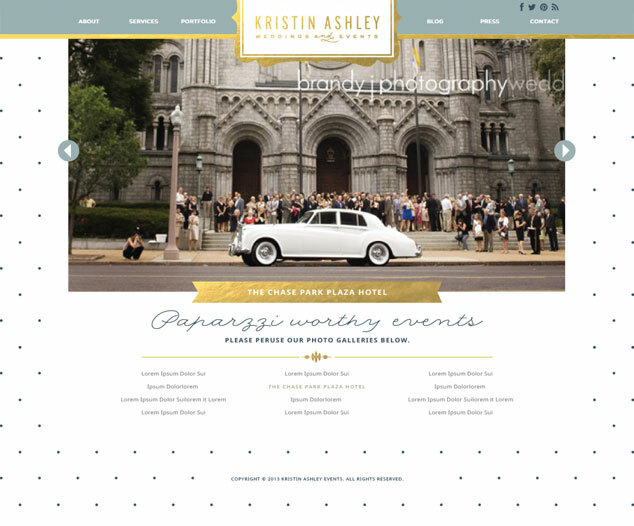 Kristin Ashley Events is a premier St. Louis, MO full service wedding and event planning company that provides proposal planning, full wedding coordination, month of coordination along with à la carte options. 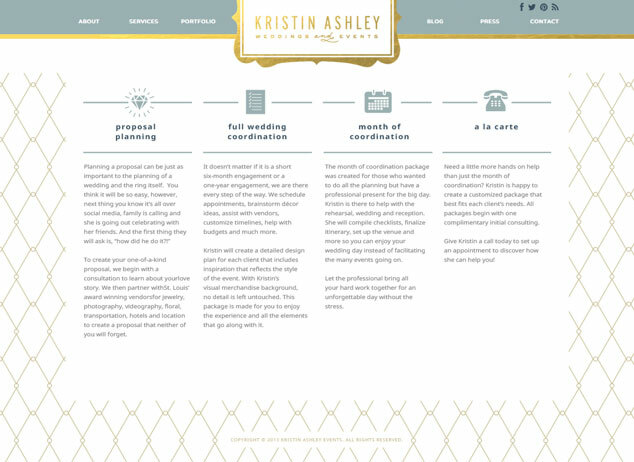 Without doubt, they are one of the best wedding planning companies in the greater St. Louis area. 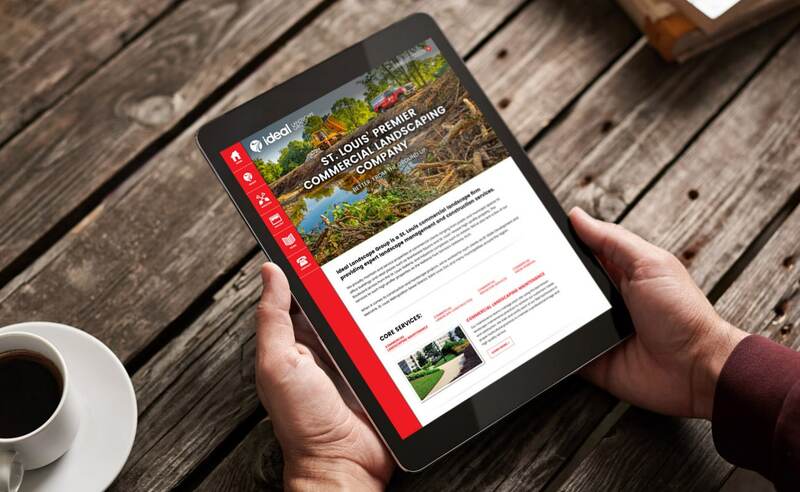 The fine designers at Cheree Berry Paper provided the new design and Visual Lure took those comps and turned them into a fully functioning responsive WordPress website. 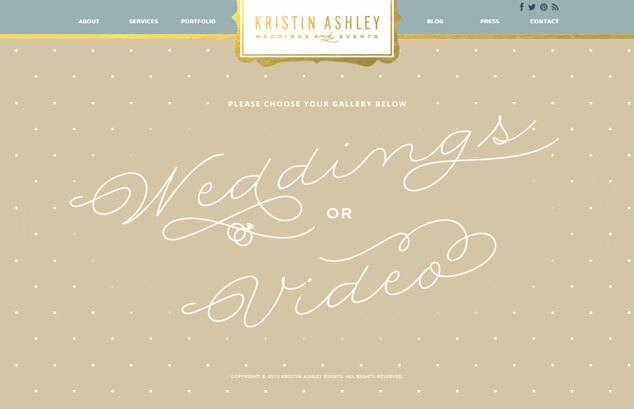 The new website features swaying roll-over frames on the home page and custom admin sections for the portfolio and press pages making it easy for Kristin to maintain. Visual Lure also designed the new contact and blog pages staying true to the aesthetic we were provided. This will be the third website we’ve developed for KAE. 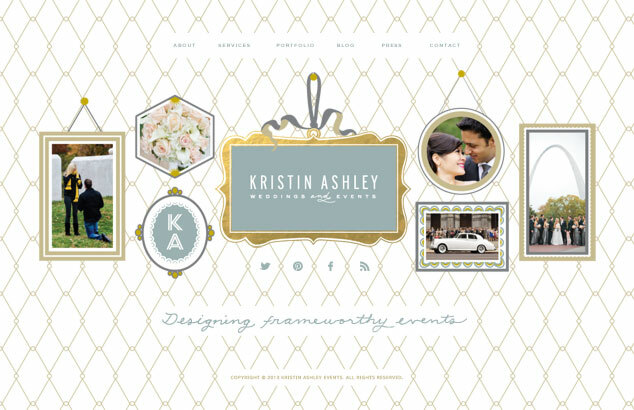 Visit www.kristinashleyevents.com to check out the new website. Learn more about our web design or WordPress design services, or contact us today for a free website consultation.